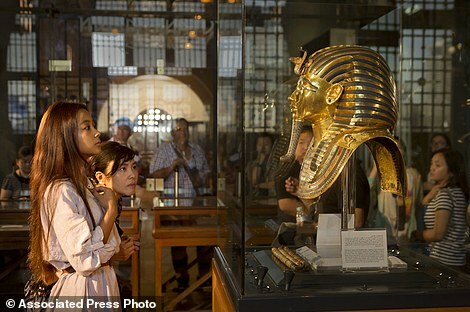 The Egyptian Museum in Cairo on Thursday began putting on display the country’s oldest papyruses, which date back 4,500 years, detailing the daily life of the pyramid-builders. The items are from the 4th Dynasty of King Khufu, also known as Cheops, for whom the Great Pyramid of Giza was built as a tomb. They reveal the daily lives of port workers who transported huge limestone blocks to Cairo during King Khufu’s rule to build the Great Pyramid, intended to be his burial structure. 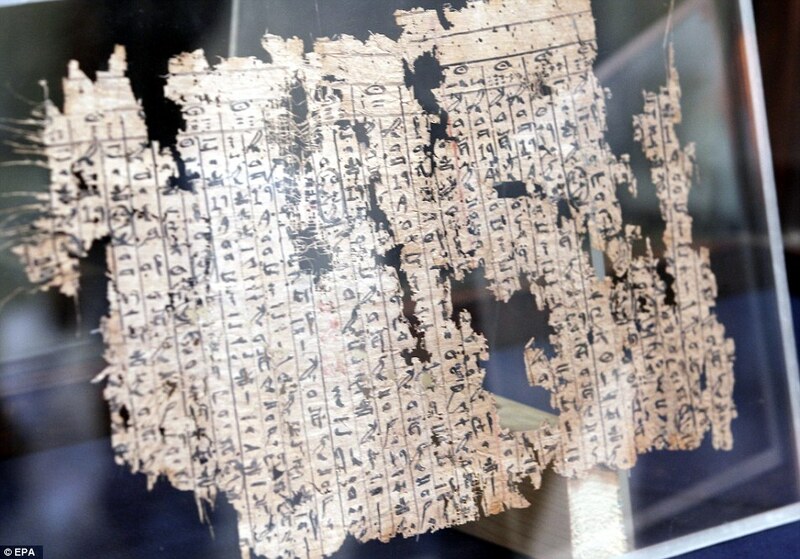 A visitor looks at one of the oldest papyri in the history of Egyptian writing among the collection of King Khufu papyri discovered at Wadi El-Jarf port, as it is on display for the first time at the Egyptian museum in Cairo, Egypt, Thursday, July 14, 2016. 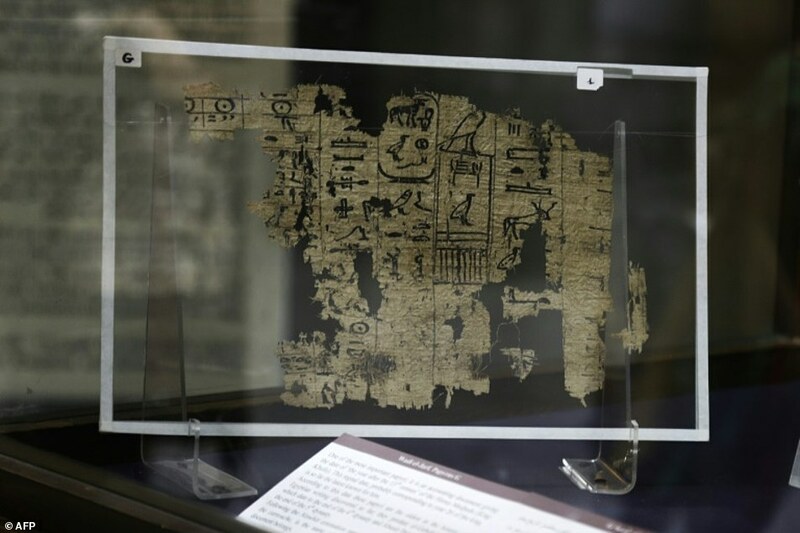 Egypt’s Antiquities Minister Khaled el-Anany told reporters as the exhibition was unveiled that the papyruses were discovered in 2013 by an Egyptian-French mission inside caves in the port of Wadi el-Jarf. The ancient port is located 119 kilometers (74 miles) from the city of Suez. 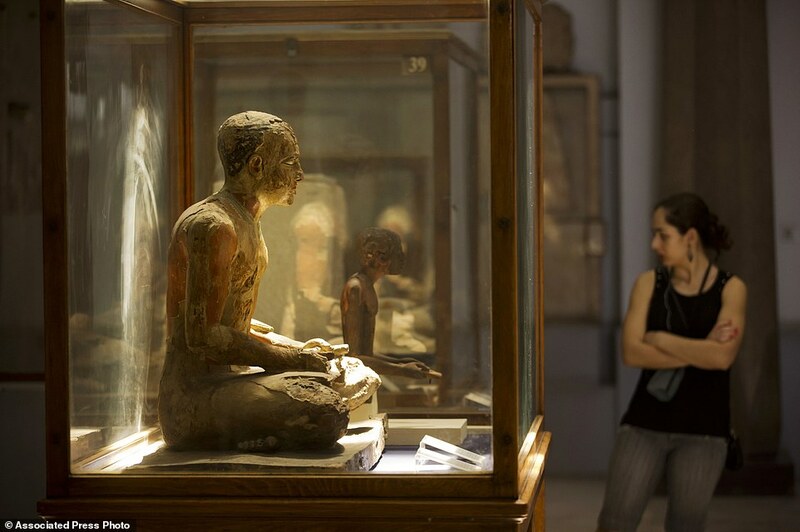 El-Anany said, the items display are ‘the oldest’ papyruses in Egypt. Museum chief Tarek Tawfiq said the papyruses depict the daily routine of the workers, who also transferred building material from the Red Sea port to Giza. One document was a ‘diary by government official Merer (the beloved) with statistics and administrative details’ of his work, said Sayed Mahfouz, who co-led the 2013 discovery. The items display are described as being ‘the oldest’ papyruses in Egypt. Museum chief Tarek Tawfiq said the papyruses depict the daily routine of the workers, who also transferred building material from the Red Sea port to Giza. One of the papyruses belonged to a senior employee named Marr who played a role in the building of the pyramid and it covered a period of three months of his job, providing information about his duties — including transporting rocks through the River Nile and its canals. Other papyruses showed the distribution of food portions for workers, including one showing in clear Egyptian hieroglyphs the number of sheep brought in. The documents also list revenues transferred from various Egyptian provinces to feed pyramid builders and pay their wages, Mahfouz said. Merer led a team of around 40, according to the ministry. Revenue was written in red, while what was paid to workers would be written in black, said Mahfouz. ‘It gives for every day an account of the work of this crew transporting limestone blocks from the quarries of Turah on the east bank of the Nile to the Pyramid of Khufu at Giza plateau through the Nile and its canals,’ the ministry said. 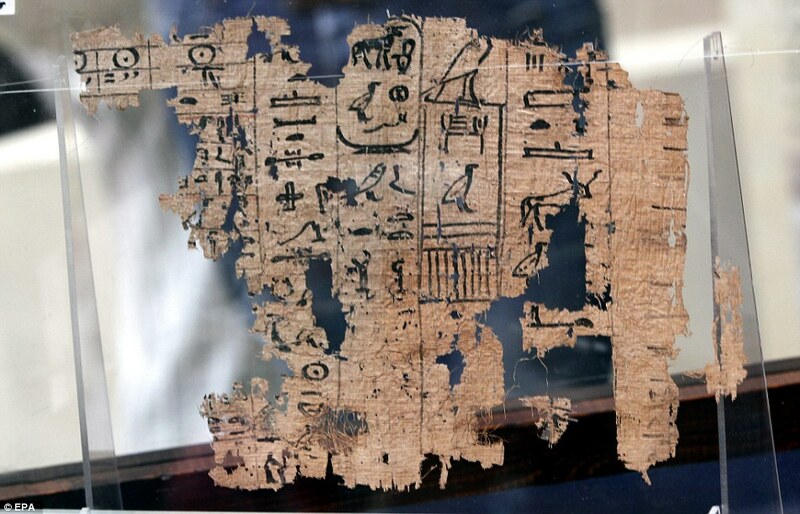 It said the papyri ‘indicate the highly efficient administrative system during Khufu’s reign’. But the long-running row over whether the Great Pyramid of Giza is hiding a network of previously undiscovered tunnels behind its stone walls could soon finally be answered. A group of researchers who have been using cosmic particles known as muons to scan the Great Pyramid of Giza have said they expect to finish their work later this month. They are using the scans to create maps to reveal the internal structure of the 479 feet (146m) high pyramid and say they could help to unlock ancient secrets that have been buried beneath the stone. Dr Zahi Hawass, a leading Egyptian archaeologist and Egypt’s former head of antiquities, is working with a team of French researchers who have been conducting the scans. This led to theories that they may be hiding a secret chamber that has yet to be discovered. 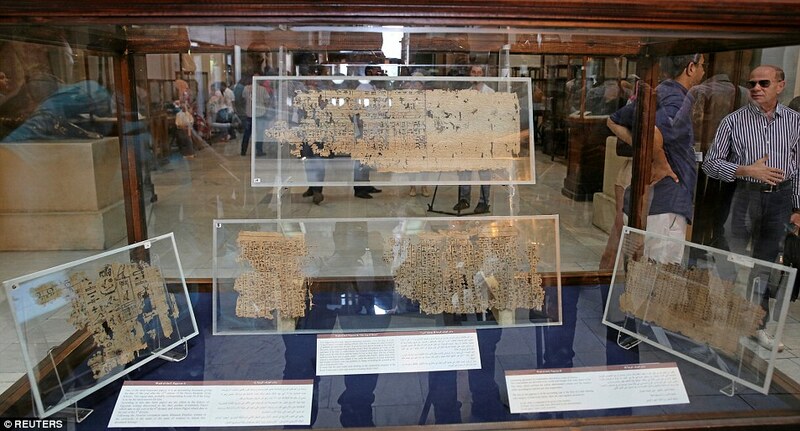 On display are a total of six out of the 30 discovered papyruses, according to Hussein Abdel-Bassir, another ministry official. 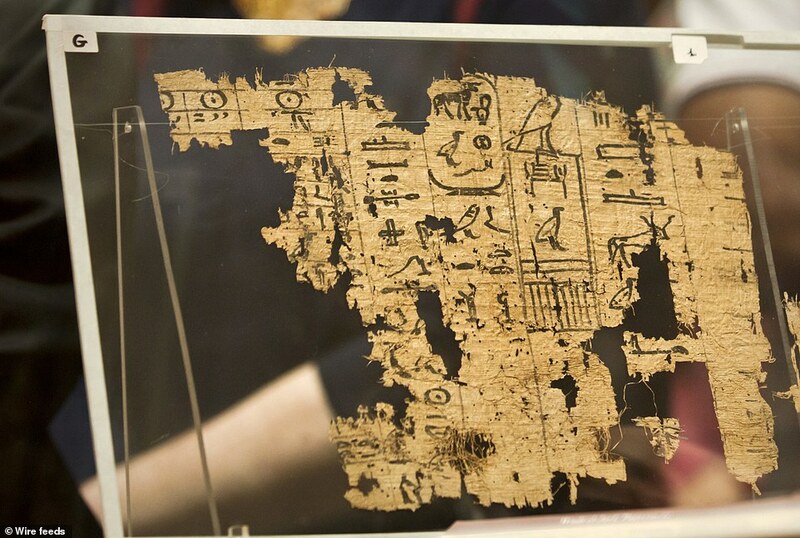 ‘These show the administrative power and the central nature of the state at the time of Khufu,’ he said. One of the papyruses belonged to a senior employee named Marr who played a role in the building of the pyramid and it covered a period of three months of his job, providing information about his duties — including transporting rocks through the River Nile and its canals, Abdel-Bassir said. 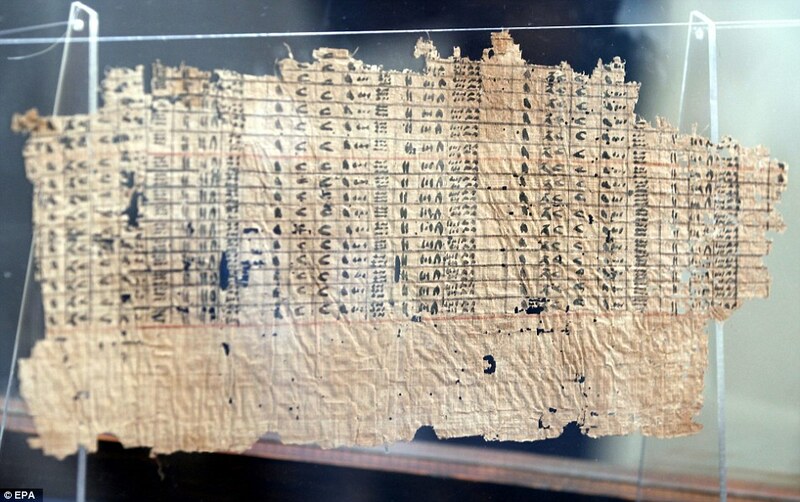 A second ministry official, Sabah Abdel-Razek, told the state-news agency MENA that other papyruses showed the distribution of food portions for workers, including one showing in clear Egyptian hieroglyphs the number of sheep brought in. 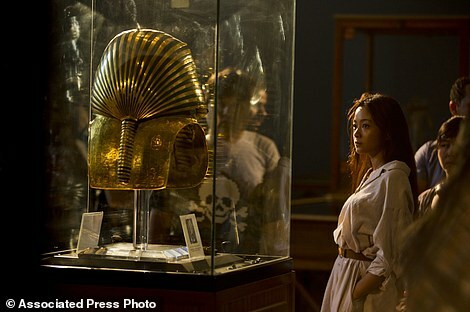 The discovery, according to el-Anany, also signaled that Egypt has a treasure of antiquities that are still being discovered.